Nike SB Officially Announces the Dunk High "Walk the Dog"
Inspired by the cannabis strain “Dog Walker,” these beauts are dropping on 4/20. 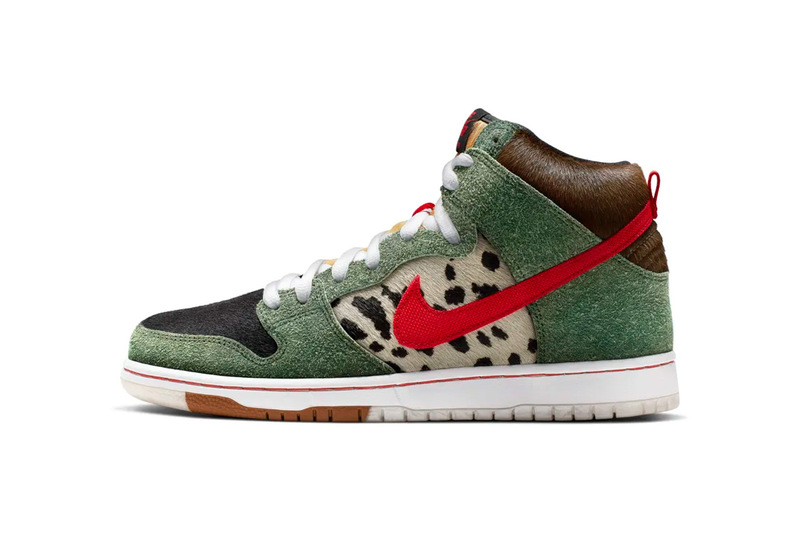 After teasing a 4/20 release of an eclectic new Nike SB Dunk High, the brand has unveiled a closer look at the cannabis strain-inspired footwear, officially dubbed “Walk the Dog.” The upcoming kicks are laden with animal prints and other canine references, including textured fabrications and specific colors that mimic a true stroll in the dog park. Along the upper, several layered compartments evoke the puppy narrative, including a spotted Dalmation pattern at the quarter, a back heel coated with pony hair for a furry aesthetic and green suede overlays that are meant to resemble grass. Nike has also revamped its Swoosh to simulate a dog leash by utilizing a coarser material, splashing the check with bright red for a bold contrast. The brand added a hit of brown on the outsole to symbolize “stepping on poop,” while a unique graphic featuring a picture of dogs (owned by Nike employees) has been emblazoned on the insole. Simple white laces, which can be swapped for brown, finishes everything off. The SB Dunk High “Walk the Dog” edition is priced at $110 USD. Expect the style to hit Nike’s webstore beginning on April 20. For more in footwear, take a look at this silhouette in the neutral “Desert Camo” colorway. Take a Closer Look at the Nike SB Dunk High "Walk the Dog"
Nike's SB Zoom Blazer Low Matches the SB Dunk High in "Desert Camo"
Take a Closer Look at the Upcoming Black Sheep x Nike SB Dunk High "Black Hornet"
Magenta and navy blue pops throughout. Comfortably seating up to seven passengers. To take place at the Museum of Contemporary Art Detroit. “Winterfell” in many ways is a spiritual successor to the pilot episode. The rapper will kick off the New York venue’s relaunch.